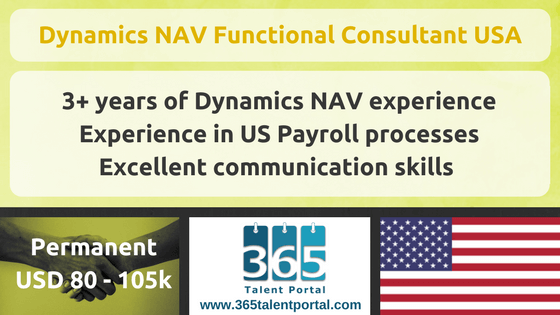 This job is only for NAV Functional Consultants located in the US. MS Dynamics NAV Functional Consultant is to “facilitate the successful implementation and maintenance of client’s software systems. You will be the team lead for NAV implementation, upgrades and support. 3 – 5 years’ recent experience of Dynamics NAV implementation and support. Experience with a NAV Payroll (Kenek/Serenic) preferred. Must know US payroll processes and be fully knowledgeable of how US payroll works.